본 연구에서는 세계가치설문조사의 한국자료를 이용하여 소득계층 인식과 정치적 성향이 개인의 환경보호에 대한 태도에 어떻게 영향을 미치는지를 평가하였다. 분석결과 사람들의 소득계층 인식이 상승함에 따라 환경오염방지를 위한 조세인상에 대한 찬성 가능성이 증가하였지만 선형적으로 증가하지는 않았고 가계의 재정상태에 대한 만족도가 높을수록 환경보호에 대한 태도가 우호적인 것으로 나타났다. 이러한 결과는 1인당 평균 소득수준이 증가하더라도 재정 상태에 대한만족도가 하락하거나 소득불평등도가 심화되는 경우 환경보호에 대한 태도가 악화될 수 있음을 시사한다. 경쟁에 대한 시각과 부양책임과 같은 사회경제적 이슈와 정치적 성향과의 관련성은 일반적 사회통념이나 서구사회와는 매우 달랐는데 이러한 차이는 환경보호에 대한 태도에도 반영되어 나타나는 것으로 보인다. 진보적 성향일수록 환경오염방지를 위한 추가적 조세부담용의가 증가하는 서구사회에서의 결과와는 달리 진보적인 사람들과 보수적인 사람들 간의 추가적 조세부 담용의에 있어서 차이가 없었다. This paper investigates the role of perceived income hierarchy and political affiliation in individual attitudes toward environmental protection. 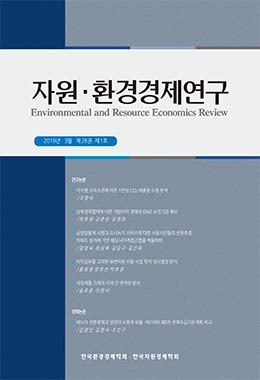 Estimation results show that rises in perceived income hierarchy increase the possibility of agreement to an increase in taxes to prevent environmental pollution in general, but not linearly increase it. As individuals are more satisfied with the financial situation of their household, they are more likely to agree to an increase in taxes. These results imply that individual attitudes toward environmental protection can be deteriorated even though average household income level increases, if either the degree of financial satisfaction decreases or income inequality worsens. We find that there is no difference between the liberals and the conservatives on the likelihood of paying additional tax to prevent environmental pollution. This result differs from the cases of Western society, which indicate that the liberals are more likely to pay for environmental protection.